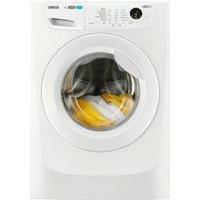 Zanussi Zwf91483Wh... stall & Disposal "
Zanussi Zwf91483Wh Li... Install & Disposal "
Zanussi Zwf91483Wh Lindo300 ... " Free Install & Disposal "
This family-sized machine cleans and spins extremely well for a great price. If you’re scouring the UK washing machine market for a relatively inexpensive, large-sized freestanding model that will deliver superb washing and spinning performances, then the Zanussi ZWF91283W could have your name on it. This is a machine for the larger household, with dimensions of 85 cm (H) x 60 cm (W) x 60 cm (D) and a maximum load capacity of a sizeable 9 kg. It has a nice wide opening – broad enough to fit even the bulkiest of duvets – and comes with a huge range of features. There are 14 programmes in all, covering cottons, sportswear, wools, delicates, a half-hour quick wash, and the usual line up. It has a panel lock to prevent anyone tampering with it mid-programme; a time-remaining display; overflow protection; and much more besides. Zanussi’s AutoSense technology saves energy and money by only releasing the exact amount of water required for your load size. PowerJet is a system which blasts the detergent drawer to ensure no streaks are left on your clothes once the wash cycle is completed, while Aquafall ensures your clothing is washed quickly and detergent distributed evenly for the best possible results. And if you want to take advantage of cheaper night time electricity – or it’s just more convenient to postpone – you can delay your programme by up to 24 hours. The Zanussi ZWF91283W has an A-rating for its wash performance and it’s not hard to see why. The results are simply fantastic, shifting stains from all fabric types, while the B-rated spin cycle contributes brilliantly to leaving your clothes in perfect condition for the dryer or clothes line. Although it comes with an A +++ energy efficiency rating, this machine – larger than many – is a bit of an electricity guzzler. There are worse out there, but it is a small tick in the debit column. Finally, at 54 dB the wash cycle is nice and quiet, but during the spin cycle this goes up to an ear-drum challenging 78 dB – the equivalent decibel level to a car whizzing past you at 65 mph. Why you should buy it: It’s a bit more expensive to run and it’s noisy during the spin cycle, but this aside the Zanussi ZWF91283W is a fabulous washing machine that deserves to be on everyone’s shortlist.